Regarding this cultural and economic transition of communities prioritizing a pedestrian infrastructure rather than an auto one, 15 days ago the entry â€˜People over cars’ begins to hit mainstream media stated, “The next domino to fall would be Fast Company Magazine – stay tuned.” We didn’t have to wait long, and we’re definitely hitting the tipping point when a business magazine like that has a headline like this, Suburbia R.I.P..
“If the suburb is a big loser in mortgage crisis episode, then who is the winner? Not surprisingly, the New Urbanists, a group of planners, developers and architects devoted to building walkable towns based on traditional designs, have interpreted the downturn as vindication of their plans for mixed-use communities where people can stroll from their homes to schools and restaurants. 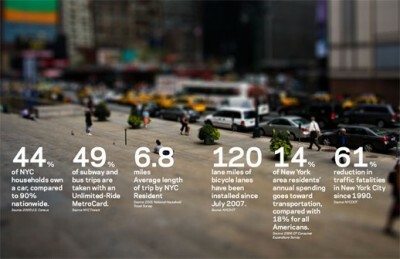 Image from New York City Department of Transportation’s Sustainable Streets Index.